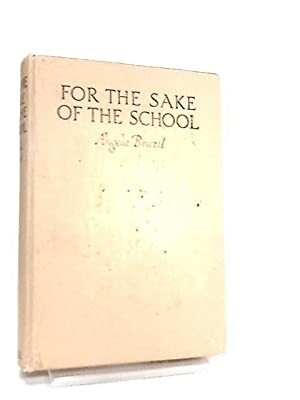 For the Sake of the School by Angela Brazil was first published in 1915 but my copy was published during World War 2 as it has that Book Production Economy Standard logo at the front and although there’s no publication date it was a gift to Rose from Jean for Christmas 1943. I didn’t read any of these books as a child, I was strictly an Enid Blyton Malory Towers/St Clare’s girl which were obviously written along very similar lines as far as morals and behaviour are concerned. Blyton probably just wrote updated versions of Brazil’s books. I suspect that Brazil was better though. It begins at a railway station as most schooldays’ stories do (Harry Potter). The girls are on their way to The Woodlands which is in a very rural setting in Wales. The two women who own the school are keen on nature and wildlife and the girls are encouraged to get out into the great outdoors as often as possible. In fact they could be regarded as nature worshipers, such is their enthusiasm. This year Ulyth (new name to me) is particularly excited because Rona the New Zealand pen-pal that she has been writing to for the last two years is arriving as a new boarder. Rona’s mother is dead and she has had a rather rough upbringing by her father who is a farmer in the wilds of New Zealand. Ulyth who has been looking forward so much to meeting Rona is rather shocked by her appearance and lack of manners. She’s keen to drop her pen-pal but is persuaded to take her on as a work in progress and try to make Rona conform more to what is expected of girls from The Woodlands School. Trials and tribulations ensue, wrong conclusions are jumped to but as you would expect – all is well in the end. I did find the storyline of this book to be more than a bit obvious, but it was still enjoyable and I can imagine that if I read this as a ten year old I would have loved it. I think most if not all of Angela Brazil’s books are available free from Project Gutenberg. It struck me a couple of times that Angela Brazil wrote as if she was Scottish, according to Wiki her mother was a McKinnel, so possibly they were originally from Scotland – or she had a Scottish nanny. In part of this book someone says that they “put something by in the dresser” – meaning they put something away in the dresser. Very Scottish. I mentioned earlier that I had been reading The Head Girl at the Gables by Angela Brazil. It was one of the books which I bought while we were in Aberdeen recently. I hadn’t read any of Brazil’s books before but as a youngster I devoured Enid Blyton’s Malory Towers books so I thought it would be interesting to compare the two writers. The Malory Towers books were written for primary school girls I’m sure and I suppose that Angela Brazil was aiming her books at older girls, so it’s maybe an unfair comparison but I have to say that the Brazil books are much better written than Blyton’s. The setting for Head Girl at the Gables is Cornwall, just as for the Malory Towers books. The book was written in 1919 and the First World War does feature in it with some of the schoolgirl’s brothers away at the front and German spies being thought to be in the area. The Gables is a small private school with around 40 girls in it. It’s owned and run by the two Kingsley sisters, unmarried of course as women teachers had to be in those days. Their first problem in the new academic year is – who to choose as head girl, there’s no obvious candidate as far as the Misses Kingsley are concerned, but one of the girls takes it for granted that she will be chosen and is very disgurntled when she isn’t. Porthkeverne is a coastal town, favoured by artists because of its quaintness and presumably its good light. Lorraine and her siblings form friendships with the Castleton children whose father has used them all as models in his popular paintings. It’s all very different from the lifestyle that Lorraine is used to, theirs is a Bohemian life with a young step-mother who had been their father’s model whom he married when his first wife died. She seems to be having a baby a year – poor thing. There are disappointments which turn out to be for the best, I suppose this type of book was a sort of guide book to life in some ways, but I think they were condemned by some when they were first published as being a bad influence for young girls, which surely contributed to their popularity! So many other writers jumped onto the school story bandwagon but I think these ones were the originals. Great Minerva! and Great Judkins! are the exclamations of the day. But the real world does break into the storyline with brothers being called up to the army and those aforementioned German spies. This was better written than I had expected, I must admit that I bought the book because I was drawn to the cover. I do like those Blackie and Son covers. I know that by complete coincidence another blogger whom I follow was also having her first experience of reading an Angela Brazil book as I was reading this one, but I can’t remember who it was and can’t find the blogpost which is annoying as I wanted to link to it. Amended: Thanks Barb. It was Leaves and Pages.